Francesca Fedeli had a hard pregnancy. But she and her husband, Roberto D’Angelo, thought they were in the clear when their son, Mario, was born in January 2011 and seemed healthy. Roberto D'Angelo + Francesca Fedeli: In our baby's illness, a life lesson However, just 10 days later, Mario was diagnosed as having had a perinatal stroke. The right side of his brain was damaged, leaving him unable to move the left side of his body. The D’Angelos struggled with depression as they proceeded with physical rehabilitation for Mario, including mirror neuron therapy, in which they modeled for their son how to use objects, on the theory that watching them would help Mario build those neural pathways for himself. (Read more about mirror neuron rehabilitation.) But they soon realized Mario was mirroring not just their motions, but their emotions as well. Check out these other talks about parents faced with impossible circumstances and what helped them get through. In this talk, Dr. Benjy Seckler introduces us to his 11-year-old son, Charley, who writes his own Mad Libs and makes brisket paninis. Charley has Duchenne muscular dystrophy, a disease that affects boys, breaking down their muscle function to the point where they lose the ability to walk by adolescence and die in their late teens or early twenties. 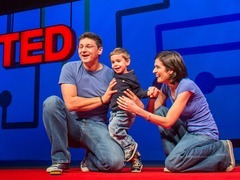 (Read about TED Fellow Darius Weems, who also suffers from the disease.) Seckler knows that the statistics on the disease are paralyzing — and yet he and his family decided to take action. In this talk, Seckler shares why they started Charley’s Fund, which supports promising clinical trials for drugs that could improve muscle strength for kids like Charley. Phyllis Rodriguez and Aicha el-Wafi are two mothers who were both deeply affected by 9/11. Rodriguez lost her son in the attacks on the World Trade Center. Meanwhile, el-Wafi’s son was convicted of playing a role in the terrorist act. The two here share their unusual friendship, struck up when Rodriguez and her family spoke out against the death penalty for el-Wafi’s son. He is now serving life in prison. Leilani Schweitzer lost her 20-month-old son after a series of medical mistakes—ending with a nurse who turned off his medical alarms, hoping that it might help him sleep. In this talk from TEDxUniversityofNevada, she points out a paradox—that patients and their families want the human element when it means kindness, but not when it means errors. She lays out a different way that hospitals can handle tragic mistakes like this—with transparency, compassion and the truth about what happened, rather than bunkering down to avoid a lawsuit. She asks: could this help heal our medical system and help avoid future errors? And to end this playlist on a lighter note, Cheryl Kilodavis’ son Dyson loves wearing dresses, adores the color pink and wants to be a princess. While her initial reaction to her son’s preferences was to push back and encourage him to play with trucks, she eventually realized: she had to accept him. Since then, she has written a book, My Princess Boy, encouraging parents to accept different gendered behavior in their kids. In this talk, she asks: why are we so scared of difference, and how can parents transcend those knee-jerk reactions? Reblogged this on Allison Porter Klinger.